Well, I've been gone for an while, and now im back, I wanted to check all my topics I created, im under Nferno-black skin, but some features have been removed. Well, the main one I miss is the "Find all topics started by".. or something similar, it used to be in your user profile, and then you could check anyones everysingle topic they made. Well i have seen the feature on other forums before; i was wondering why this forum dosn't have it. We had to remove that feature. You see, kids could read the topic titles we made in the Moderators section. We don't want anyone leaking our secret plans. I actually miss that .. I say we need them back. Perhaps Nferno can limit the user to only view topics He/She created ?? then you could bring back this feature but dont allow to normal members to see the staff's topics.. Wait how can we see moderator's and Sysop's "masterplans" in the all topics created section if we can't even see them on the actual forum? Yeah this could be like this: You look up someones' name and it says all topics started by that person. 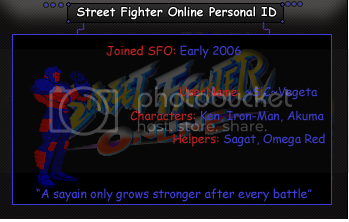 Quote[/b] (KingofStreetfighter101 @ Nov. 26 2007,11:38)]Perhaps Nferno can limit the user to only view topics He/She created ?? Because i had thought that I had just use that feature to check what topics i have made i was trying to use it as a shortcut lol. But all this time I thought this feature was still usesable but i guess i should have checked up on that ehh..... ohwell. Damn why you didn't make the post about jason getting banned.. Imagine if he would of saw that..
when was the last time i created a topic? which is why i told ou ppl to work with that method but no...no-one ever listen to me unless i ban them...right cwing?